Every game comes direct from publishers. It’s been three thousand years after the Great War and the collapse of the hyperspace lanes. The galaxy is reawakening, thanks to an unknown influence who has restored the warp lanes back into operation. Who restored the warp lanes, and for what purpose? Legacies introduces a new playable faction, the cyborg Tinkers. The Tinkers are a race of cyborgs who worship Dzibix, an ancient mega machine located on their arid homeworld of the same name. Dzibix is -- or was -- an automated factory built by one of the ancient civilizations of the Golden Age. The Tinkers worship Dzibix as a machine god and as result it has grown to cover most of the planet and has achieved at least minimal self-awareness. To appease their machine god the dutiful Tinkers have converted themselves into cyborgs and remade their society as a cybernetic civilization. Tinkers’ ships have increased armor, self-repair capability, and special systems for handling missiles and fighters. The Tinkers will have a custom home world and a full set of custom spaceships to build, and will take special advantage of several new gameplay features. Also joining the galaxy is new minor faction: the hyperspace-dwelling Arda Seed. The Arda Seed will employ a number of new starship and station types, and make special use of several new gameplay features. The Arda Seed faction represents the next step in uncovering the story of the causes behind the Great War, which will continue to be expanded upon in upcoming DLC. 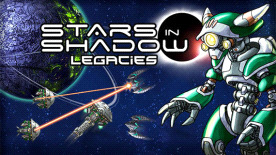 Stars in Shadow: Legacies © 2017 Ashdar Games INC. Developed by Ashdar Games INC. Licensed exclusively to and published worldwide by Iceberg Interactive. Iceberg Interactive design and mark are registered trademarks of Iceberg Interactive B.V. Microsoft®, Windows® and DirectX® are registered trademarks of Microsoft Corporation. All other brands, product names, and logos are trademarks or registered trademarks of their respective owners. All rights reserved. Made in Canada. ©2019 Green Man Gaming Limited. US Patent Pending. All rights Reserved.